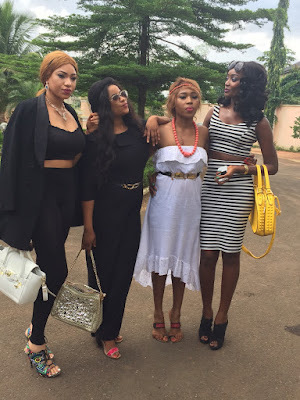 Nollywood actress Uju Okoli is the daughter of veteran actor and Director- Obi Okoli. Uju Okoli sometimes ago posed with Mercy Johnson okojie & wrote: I have admired u and ur good works a long time,craved to be on screen on with her since I started my amazing journey on screen,and she effortlessly made it easier for me with her encouragement and lessons while we worked,she is beautiful in and out,I heart u,let me use her words “I love u like crazy” @mercyjohnsonokojie,smiles…..#workingwithuwasgreat#Godovereverything #wedidagreatjob#thankyoumamap…..
Uloma the village fighter, my my my,beautiful story @ayaka_global talented cast @mercyjohnsonokojie @kenerics @ujuokoli21@ayaka_global @Real_bettybellor gifted makeup artist @vicksgabby4 Conti @dinolified costumier @amara_nwadike ……and my wonderful boss and mama toh badt @presstoraproductions ……tittle coming ur way soon #GODISGREAT #ITWILLSURELYENDINPRAISE #HEALONEMADEITPOSSIBLE #THANKUJESUS……. Obi Okoli in 2015 starred alongside with Liz Benson, and Yul Edochie, in a TV series titled The Palace, shot in Owerri, Imo State. Also in the series are Chiwetalu Agu, Geraldine Ejiogu, Adaeze Eluke, Queeneth Hilbert, Stephanie Scott, and Uju Okoli. 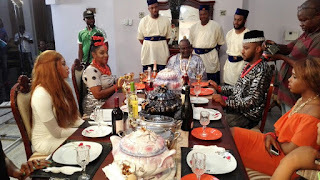 The series is being directed by Chidi Anyanwu, and it is being produced by Kingsley Okereke of Divine Touch Production.